This is my fourth Sundance Film Festival, and Dan’s third. However, this is the first year we came for the entire 10 days of the festival. It was an incredible time. Our friends came for the long Martin Luther King Day weekend and my family came for the second half to celebrate my mom’s big birthday. It’s still my favorite vacation by far, where else can you find such a great combination of world-class skiing, independent film, top-notch restaurants, celebrity spotting, bar hopping, and just hanging out with friends/family in the hot tub after a long day?! Below are my top 10 Sundance 2009 moments! For photos of friends, films, and lots of celebrities, click here. 7. Bringing Zookie into the Filmmaker Lodge, where industry folks network and talk shop. We were hoping he’d get “noticed” – but not this year. 10. 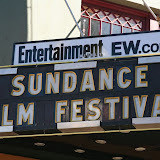 Sharing the experience with 20 “Sundance Virgins” – our friends and family are hooked!